Sometimes I feel as though it takes an entire Monday to recover from the weekend. Yesterday was a particular rough day with the kiddos which resulted in a two frustrated, frazzled parents and three mini-destroyers who were sent to bed by 7:00 p.m. The day also required that I clean the living room carpet Sunday evening. It was just one of those days. There were a couple fun points over the past couple days despite a few disasters. 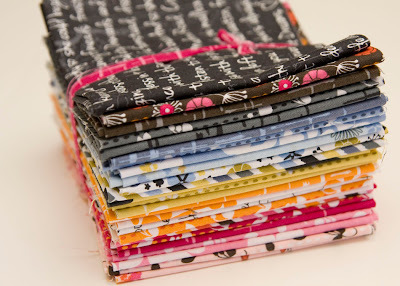 It's an adorable little fat 1/8's bundle of Madrona Road by Violet Craft. Sukie went home with a much bigger bundle of the same. You see, Amanda has a cute little Etsy shop called Westwood Acres. You can find A Crafty Fox on Facebook as well. She specializes in precuts and bundles. She and her husband hand-cut charm packs, 2.5" fabric rolls, and bundles from fat 1/8's to full yards. She usually ships same day, unless you get together for yogurt in which case she hand delivers your fun package! I adore this line. The colors are great and the prints are so fun. I wasn't planning on getting it, but surprisingly it's now on my shelf. I've never bought a fat 1/8's bundle before, but after pulling these out, I am really liking the idea of the smaller cuts. It's just enough to make a fun quilt without having loads leftover. I might do something really simple with it like a charm quilt. My other thought is using Sarah's pattern for her Stained QAL over at Narcoleptic in a Cupboard. The other fun stack I received came this morning courtesy of Michael Oakshott. 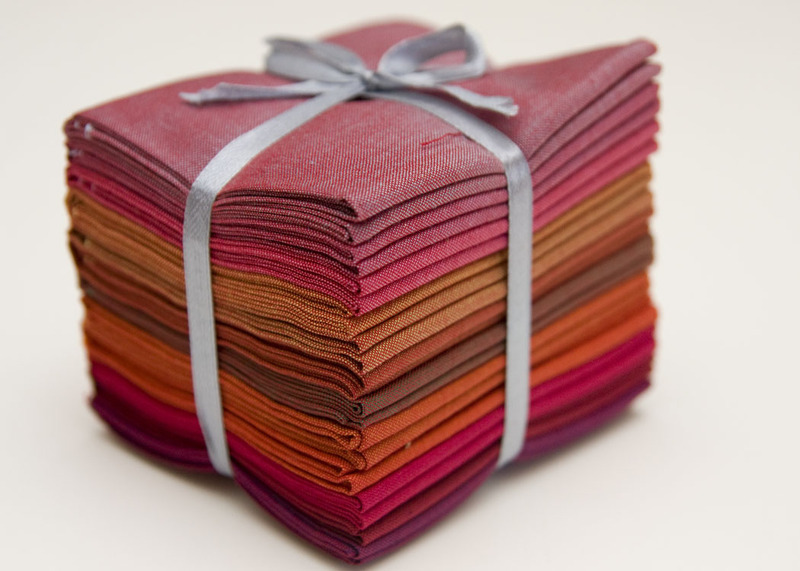 This is a cute little fat 1/8's pack of Ruby Reds from Oakshott Cottons. I am really excited about this stack. 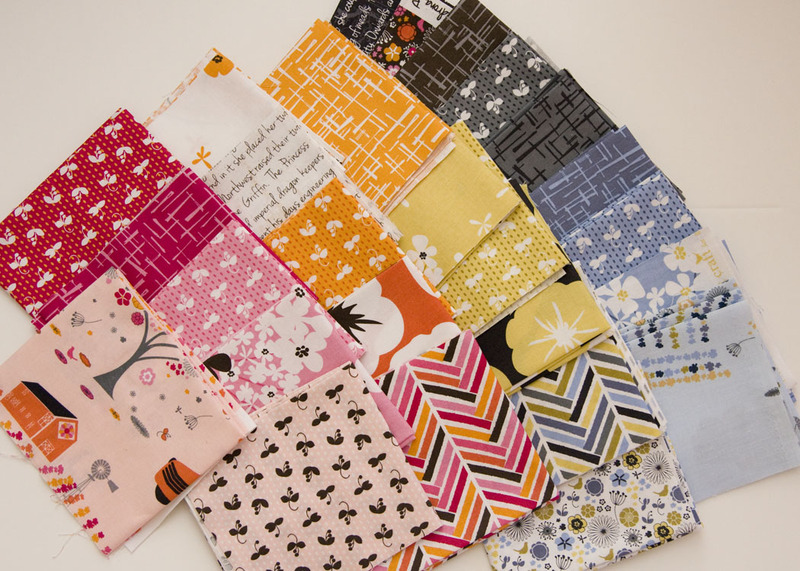 I've been drooling over the Oakshott Cottons since I started seeing them over at Lily's Quilts. I was thrilled when Michael offered to send me a small bundle. I have plans for this little stack. I've already opened it and will cut into it very soon. This stack contains 12 fat 1/8s, and I plan to use every single scrap for the project I've planned. Hope you all had a great weekend and weren't stuck cleaning carpets like me. Tomorrow will start my first "hallway" link-up party. I'm excited to see your favorite July projects. That stack of Oahshotts is beautiful! Absolutely can't wait to see what you do with it. Oh, the mini-destroyers...bedtimes are such a blessing! Hope your Monday is going better than yesterday! Hope today is going much better and doesn't require any carpet cleaning! Nice! Both of those lines are just gorgeous. I would especially love to get my hands on some of the Wild Carrot print. So pretty. Hope your carpet came clean! I know those kind of days! I hope the new fabric helped. They are lovely bundles. Enjoy! Fat 8's are a surprisingly convenient cut. Who knew? There must be something in the air - our little one had us pulling our hair out this weekend too. The colors of those oakshot cottons are fabulous! I've been eyeing them for a long time, but I absolutely love those. They totally scream fall to me! I have had my eye on both those bundles for a while - look forward to seeing what you do. We all have those frazzled days - hope today is better for you! Fabric cures a lot of ills, doesn't it? And such pretty fabric, too!! I like when i can call you up and go fabric shopping with our "dealer" ha!